Before we get on with some tips on selecting the most suitable compound bow, please have a look at the compound bow graphic with its various components illustrated for better understanding of your bow. Compound bows have been around for a while now and are now very popular not only among hunters, but also competition archers. What is a compound bow and how it is different from traditional recurve or long bows? Compound bows are an improved bow for higher poundage draw weight bow. Compound bows are hand drawn like traditional recurve or long bows, the only difference is that compound bows have an additional string cable running over a pulley and an oblong cam or two cam pulleys in double cam bows. When archer pulls the string, the cam pulley transfers most of the draw weight on the cable string and archer can easily hold the puller string while he aims. Normally compound bows are made with a combination of alloy aluminium for riser, fibre glass or carbon fibre wood composite limbs and aluminium cams. The modern compound bows can deliver an arrow with a matching kinetic energy that of bullets. There are a number of big brands in the market like Hoyt, PSE, Mathew, Martin, Bowtech, Win & Win, Bears, Barnett and many others. Archery is an age old hunting/ Target sports, requiring great amount of practice, skill and concentration. A successful archer is less indebted to the equipment than to his skills and patience. Some archers today tend to compare their competitors by the brand and the model they carry. Without belittling various innovations by world bow manufacturers, let me state without hesitation, that your bow will not affect your performance drastically, as long as you have taken care to select a bow suitable to your size, strength and comfort. As a matter of fact, the arrow quality and selection may turn out be more critical than the bow itself. 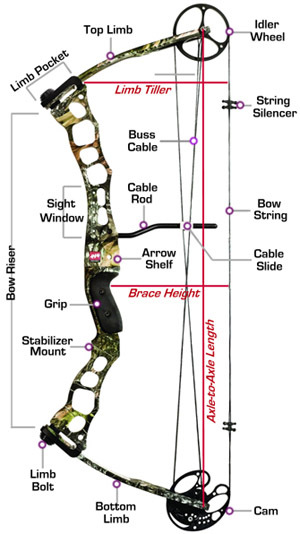 Let us now try to figure out a few guidelines on selecting your bow, specially your first bow. Brace heights is the distance of the string from the bows grip on the riser when the bow is not drawn. Here, we follow a simple understanding that the closer the string is to the riser, longer is contact period with the arrow before it leaves the bow on its journey; string imparting more kinetic energy to the arrow, so more speed and more power. Normally, compound bows are available in 6"-7" brace heights. While experienced archers would go for a combination of shorter brace height and bigger draw lengths to get an extra power stoke, the beginners and amtuers should start with a taller brace height for the a given draw length for more accurate performance. Normally, beginner and ladies bows have a shorter draw length, so a little smaller brace height tends to add to pwer stoke without compromising accuracy. The distance between the axles of the two cams of a compound bow is known as the axle to axle length, it is slightly smaller than the bows height if bow is placed on its tip. Most manyfacturers make compound bows with A to A lenghth between 32-36". While shorter bows are mainly used by hunter archers, the longer ones with 36" lenght are competition bows. There are some models in 28-30" also for hunting purpose. Youth and women compound bows are normally with A to A length between 25"-28". Unlike traditional bows, most compound bows have a fixed maximum draw length, though one can adjust draw length by making minor adjustments. The draw length is the distance between the riser and the nock point when the bow is fully drawn. Please see the illustration below to understand more clearly. A suitable draw length may be very critical in your performance on compound bows. For all those whose body structure is in normal proportion, one can get the ball park suitable draw length by the height of the person, but more specifically, draw length is calculated by measuring the spread arm span in inches of a person and dividing it by 2.5 to get suitable draw length. Generally, a normally proportioned body type, person’s height and arm span are equal. Please see the illustration below to see how arm span is measured. It is important that you should stand in normal upright (Do not hunch up or stretch the shoulders) posture and spread you your hand horizontally with your palms facing outwards. Please see the indicative correlation between arm span and correct draw length. Please remember that these are just indicative in nature. There may be other parameters, like if you have longer fingers than normal, then you should reduce the draw length a little to get the draw length. Conversely, if you have shorter than usual fingers, you may consider going in for a little extra draw length than indicated by this method. Conventionally, the draw weights are measured as weight in pounds. Draw weight for a specific compound bow is a measurement of maximum force required to draw the string to maximum draw length. It is obvious that different people have different strengths based upon age, body type, and exercised muscular strength. You work the same shoulder and arm muscles to draw a bow, which you use when you row a boat. As you practice more archery, you will experience a gain in your draw weight capacity. Typically, I recommend somewhat less draw weight than your maximum strength for ease and joy of the sport. Avoid choosing a very heavy draw weight bow, unless you are the tough and dedicated archer shooting hundreds of arrows every week. Though, one likes to believe that heavier draw weight will add to the shooting speed, it is not always the case, as according to IBO (International Bowhunter Organization) recommendation, you should use a heavier arrow for higher draw weight ( Approximately 5 grain of arrow weight for each pound of draw weight), so the additional energy stored in higher draw weight gets used up by heavier arrow without adding anything to the shooting speed. There are no absolute correlations for selection of the right draw weight other than your own evolved sense after practicing the sport for a while. There are however, some guidelines based on age group and physical structure for your to narrow down to your suitable draw weights. Here is a chart for your quick glance.